On April 18, 15-year-old Nicolas Daigle was rushing from a friend’s house to get home in time for dinner. “I was at home with my 11-year-old daughter preparing dinner when I received the call,” says Nicolas’s mom, Karen. Nicolas had collided with a car at an intersection while riding his bike, propelling him across the hood of the car and causing him to land on his face. “It was by some miracle that someone I know was passing by, recognized Nick and called me to say that he had been in an accident,” recalls Karen. Karen got to the scene of the accident in time to ride in the ambulance with her son as they made their way to the Montreal Children’s Hospital (MCH) Emergency Department (ED) which is a provincially designated Trauma Centre that provides a spectrum of trauma care to children and adolescents. The Trauma team was notified that a category 10/10 trauma was on its way and to get ready. “A 10/10 is the highest level of activation for the most severe traumas,” explains Debbie Friedman, Director of the Trauma Department at the MCH. “It involves as many as 20, and sometimes more people all with different expertise in the medical, surgical, nursing, psychosocial and rehabilitation care of the trauma patient and their family. The Trauma team is like an orchestra, everything must be perfectly timed and work in harmony,” she adds. Nicolas suffered multiple lacerations to his face, as well as a few loose teeth and a concussion. Dr. Brett Burstein, emergency physician, was the trauma team leader (TTL) the evening Nicolas was rushed to the ED. Dr. Burstein volunteers to be a TTL because it’s a program he believes in, “This is a model program for interdisciplinary team work. 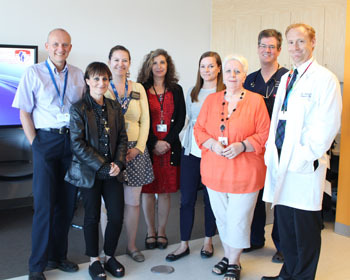 It is a well-organized approach to caring for some of the sickest patients. These patients rarely get to go home right away.” Nicolas was no different, he spent one night in hospital, where he was offered a book to read, some pet therapy and the support from a member of the Spiritual Care team. But the care he received did not end there. “We take care of the patient and the family even after they are discharged,” says Diane Richard, Trauma Coordinator. She ensures the orchestra continues to play even outside the ED by scheduling follow-up appointments, which for Nicolas meant seeing specialists in the Concussion, Dental and Plastic Surgery clinics. The team also takes phone calls from parents who might have questions about their child’s recovery. Nicolas does not remember the accident but says he is very happy he was wearing a helmet knowing he may have suffered significantly more severe head trauma had he not been wearing one. 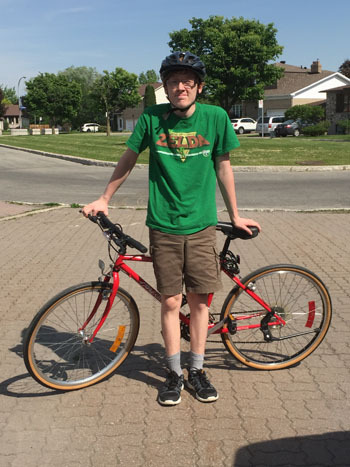 He gradually returned to school and couldn’t cycle for a few weeks while his bicycle was in for repairs but when the time came, he had no reservations about getting back on his bike --with a helmet on, of course.